When I first started to question Christianity 7 yrs ago, Easter along with Christmas was dissected. Learning that paganism was mixed with Christianity was a shock to me. I started thinking my whole life was a lie and it was! I started changing how I was going to “celebrate” Easter so I wouldn’t go to hell for still going along with the tradition because I had kids’ dreams I didn’t want to crush. But I was looking at it all backwards, they mixed Christianity with paganism to give it some substance, some truth. I actually hate using the word pagan or paganism because these cultures and beliefs were founded in more spirituality then Christianity was. Believing in the mystical, the unseen, the earth, the stars, etc. isn’t paganism, it’s truthful, honest and raw spirituality. I come from a long line of ministers on both sides of my parents’ family. My mom’s mom, my grandmother was a minister and we would talk a lot but never about anything spiritual. Regardless, when I found out about Easter and Christmas I asked my mom if grandma knew about this because she had to have known. My mother replied yes but she wanted us to still enjoy the perks of those holidays. A part of me was upset with that response but I knew where my grandmother was coming from. Also I wasn’t upset at my mom for knowing and faking through the belief system with us when we were kids because I didn’t hold her obviously to standard of my grandmother the minister. But now knowing the difference between spirituality and religion I don’t care for this subject anymore but I’m writing about it because of something I saw on Facebook. A lot of christians share and like posts like the photo above and still go full throttle for Christianity. You know it’s a lie, it’s a con mans job, an impersonator religion but they’re still fully committed to giving this religion 100% of themselves, their money, and their time. 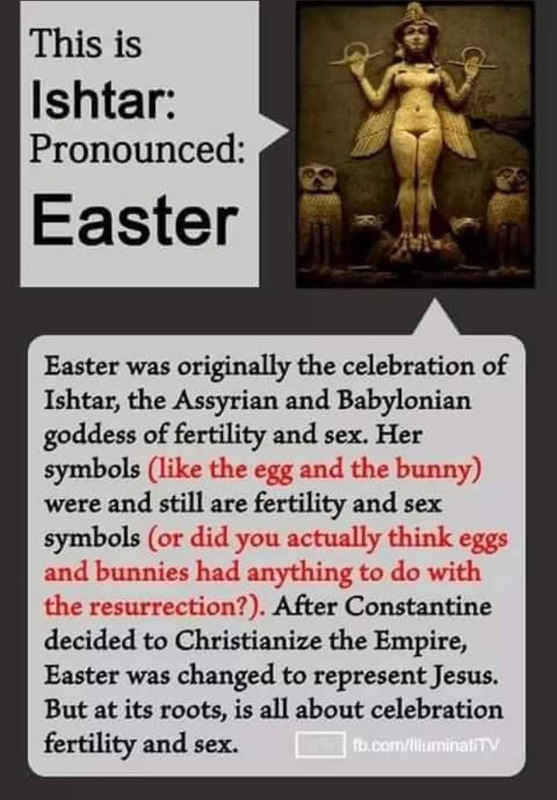 It puzzles me and I watch this unfold on Facebook every year around Easter and Christmas with posts about how these pagan holidays are the complete foundation for Christianity’s main events. But these christians still attend their daily music practices, coordinate their plays, buy their Sunday best and role play along. Just puzzling!